Finding unique and special jewelry can be hard these days. You're sure to find skulls and dark Victorian jewelry practically anywhere. That's why I was pleased when I saw Come Day Go Day on Etsy. These pieces look like ghastly antiques. 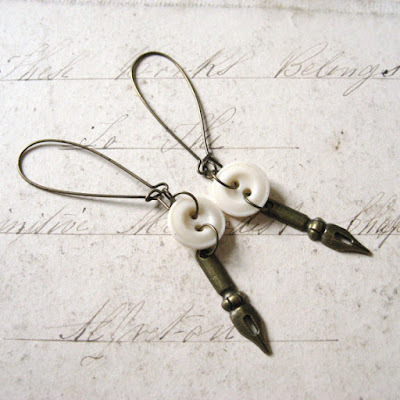 They are made in a way that tells a mysterious and curious story. Take a peek and tell me what you think in the comments section down below. Typically, an anatomical heart would fall under the "easy to find" category. 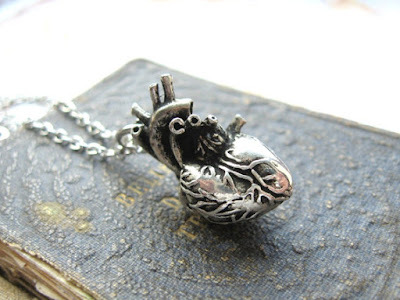 In this case, the My Beating Heart necklace is slightly different. The metal work is so stunning that you can see the tubes and veins your heart would typically have. It's a grisly piece! 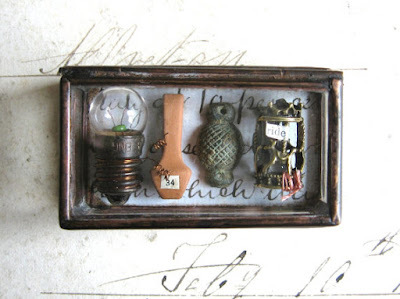 I find this pocket museum absolutely fascinating. The carousel is my favorite artifact in this glass box. I'm just surprised that you can actually make out what it is for how small it appears to be. 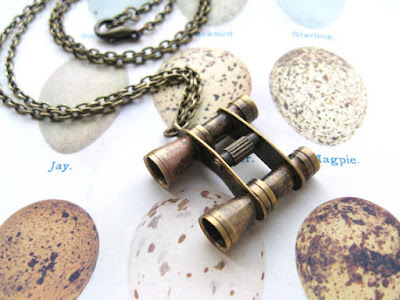 Though I'm not much of a bird watcher, I enjoy this brass binocular necklace. I've always loved the design of vintage Victorian binoculars, they are so sophisticated. Every high class household seems to always own a pair. 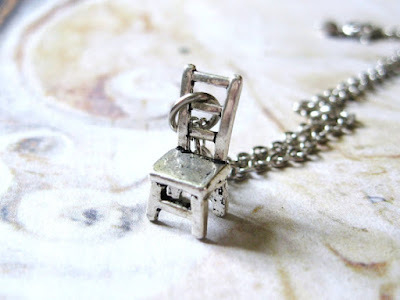 The Be Seated necklace seems to be very simple in design. I've already begun thinking of a dark story that could be represented by this necklace. I wish the chair was plated in a black silver rather than generic silver. You can see the mischief in the eyes of these foxes. 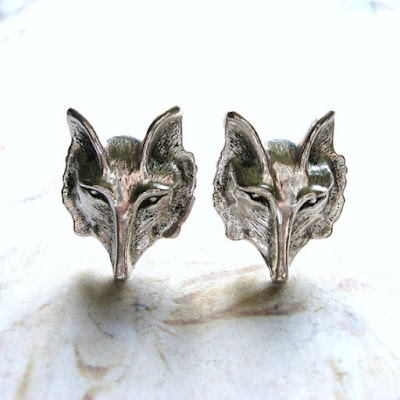 Rufus Rufus cuff links have a malevolent air about them. Slightly whimsical, but still mostly evil. A trickster should wear these cuff links. 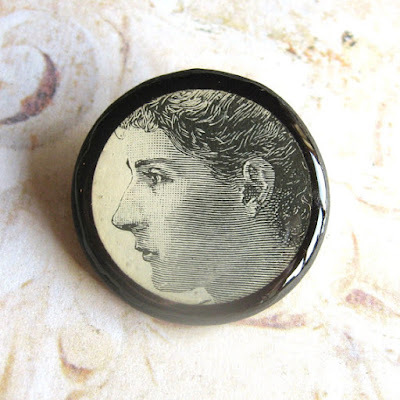 These Buttons and Nibs earrings are really interesting. I definitely love the crafty vibe coming from them. This is something I imagine my grandmother passing down from her great grandmother. Do you find this bat to be a little odd? He looks like he overindulged on someone's blood! 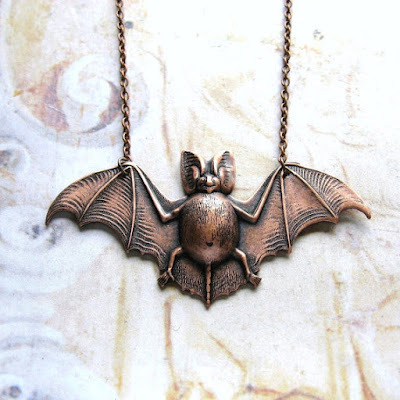 Archie the long eared bat necklace is very playful, but definitely feels sinister. No one wants to be around this glutton of blood alone. 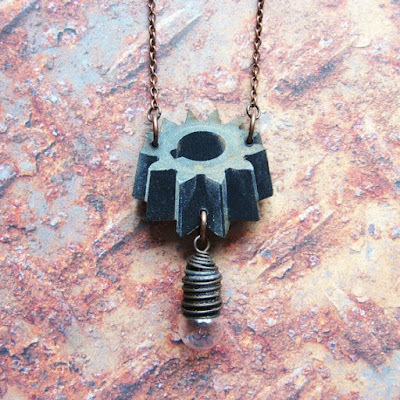 I like this Gear necklace more than some steampunk jewelry that is out there. It looks aged and used, which gives it a lot of character. It's like an antique from the beginnings of the steampunk era. Do you like vintage illustrations? I think this Imogen wooden brooch is beautiful. It reminds me of all my favorite Victorian classics. It's a very similar style to Alice in Wonderland and Through the Looking Glass. 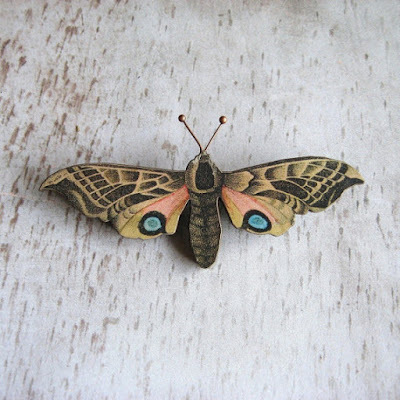 This eyed hawk moth brooch is really amazing! It would be so creepy to glance over and think you're being stared at. I'm glad the colors aren't overbearing and the dark brown hues is what really takes over. I would check out all the pieces of jewelry Come Day Go Day on Etsy has to offer. Most items are very steampunk driven, but there are some dark Victorian elements as well. Comment below!